Find the Software Products and Suppliers with the Best Fit for Your Company. 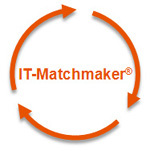 IT-Matchmaker® offers an allround market search based on your company and project profile. It takes only a couple of clicks to positively identify the software vendor and the software products which cover your company’s individual requirements. And not only functional aspects are considered for the search: information on the software vendors and their references are also stored inside IT-Matchmaker and analysed at the same time. IT-Matchmaker market search is free for companies looking for business software – try it now! You register free at www.it-matchmaker.com and create your individual requirements profile. Which type of solution are you looking for? Up to which degree do you want your business processes to be supported? Which technological criteria are important? Which services should you future system supplier have on offer? IT-Matchmaker creates a ranking of all software solutions according to your search profile. The software products' profiles have the same structure as your search profile so that the comparison is one to one. At the same time, about 16.000 reference profiles are analysed and taken as an additional clue as to the experience and the know-how of the vendor. You determine your 20 favourite solutions by analysing the ranking and the extensive background information and then order your free personal Top20 Report. It brings all the information as well as the results of your analyses together in one document and presents them in a clear form.